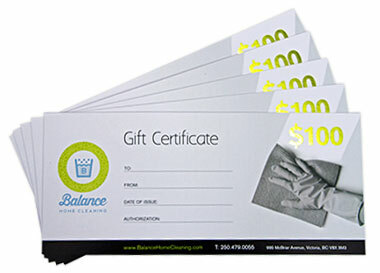 Gift certificates from Balance Home Cleaning make a thoughtful gift for any occasion. Whether you are thinking of someone special on their birthday, the holidays, or for any other reason, our certificates will provide your loved ones with the gift of a clean home and the luxury of free time. Balance Home Cleaning gift certificates can be redeemed for any of our cleaning services that we provide within our service area. For more information, please check out our services page. Gift certificates are available in $100 denominations (CAD) and may be purchased securely online using your PayPal account, Visa or MasterCard. For orders exceeding $500, please contact us directly at 250-479-0055. Step 1 – Select quantity. Step 2 – Click on Buy Now. Step 3 – Complete the payment & shipping information. Mattias and the team at Balance Home Cleaning do not disappoint. They are professional, hard-working and have an incredible dedication to detail. We are always so thankful when the Balance Home Cleaning Team has been to our home. They make raising two boys under the age of two (!) just a little bit easier. We are happy to support a local company and have and will continue to recommend Balance Home Cleaning to others.